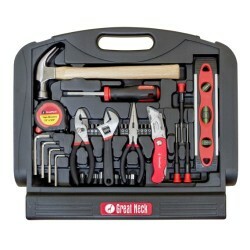 All the tools needed in a convenient stand up storage and carrying case. Covered by GreatNeck limited lifetime warranty. GreatNeck has been a hand tool manufacturer since 1919. Our tool brands strive to bring value in design and function. We stand behind our brands and offer an industry-leading lifetime tool promise on workmanship and materials.